Now, a team led by astronomers at UC Santa Cruz has succeeded in obtaining an infrared spectrum of WISE 0855 using the Gemini North telescope in Hawaii, providing the first details of the object's composition and chemistry. Among the findings is strong evidence for the existence of clouds of water or water ice, the first such clouds detected outside of our solar system. "We would expect an object that cold to have water clouds, and this is the best evidence that it does," said Andrew Skemer, assistant professor of astronomy and astrophysics at UC Santa Cruz. Skemer is first author of a paper on the new findings to be published in Astrophysical Journal Letters and currently available online. A brown dwarf is essentially a failed star, having formed the way stars do through the gravitational collapse of a cloud of gas and dust, but without gaining enough mass to spark the nuclear fusion reactions that make stars shine. With about five times the mass of Jupiter, WISE 0855 resembles that gas giant planet in many respects. Its temperature is about 250 degrees Kelvin, or minus 10 degrees Fahrenheit, making it nearly as cold as Jupiter, which is 130 degrees Kelvin. "WISE 0855 is our first opportunity to study an extrasolar planetary-mass object that is nearly as cold as our own gas giants," Skemer said. 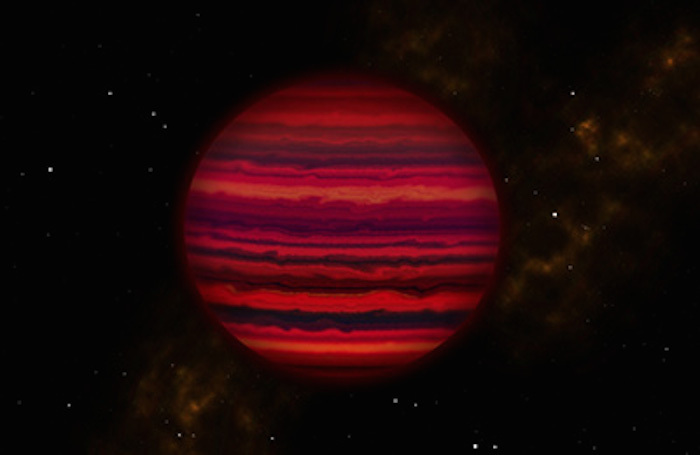 Previous observations of the brown dwarf, published in 2014, provided tentative indications of water clouds based on very limited photometric data. Skemer, a coauthor of the earlier paper, said obtaining a spectrum (which separates the light from an object into its component wavelengths) is the only way to detect an object's molecular composition. WISE 0855 is too faint for conventional spectroscopy at optical or near-infrared wavelengths, but thermal emission from the deep atmosphere at wavelengths in a narrow window around 5 microns offered an opportunity where spectroscopy would be "challenging but not impossible," he said. The team used the Gemini-North telescope in Hawaii and the Gemini Near Infrared Spectrograph to observe WISE 0855 over 13 nights for a total of about 14 hours. "It's five times fainter than any other object detected with ground-based spectroscopy at this wavelength," Skemer said. "Now that we have a spectrum, we can really start thinking about what's going on in this object. Our spectrum shows that WISE 0855 is dominated by water vapor and clouds, with an overall appearance that is strikingly similar to Jupiter." The researchers developed atmospheric models of the equilibrium chemistry for a brown dwarf at 250 degrees Kelvin and calculated the resulting spectra under different assumptions, including cloudy and cloud-free models. The models predicted a spectrum dominated by features resulting from water vapor, and the cloudy model yielded the best fit to the features in the spectrum of WISE 0855. Comparing the brown dwarf to Jupiter, the team found that their spectra are strikingly similar with respect to water absorption features. One significant difference is the abundance of phosphine in Jupiter's atmosphere. Phosphine forms in the hot interior of the planet and reacts to form other compounds in the cooler outer atmosphere, so its appearance in the spectrum is evidence of turbulent mixing in Jupiter's atmosphere. The absence of a strong phosphine signal in the spectrum of WISE 0855 implies that it has a less turbulent atmosphere. "The spectrum allows us to investigate dynamical and chemical properties that have long been studied in Jupiter's atmosphere, but this time on an extrasolar world," Skemer said.